Maybe that's all he can say. 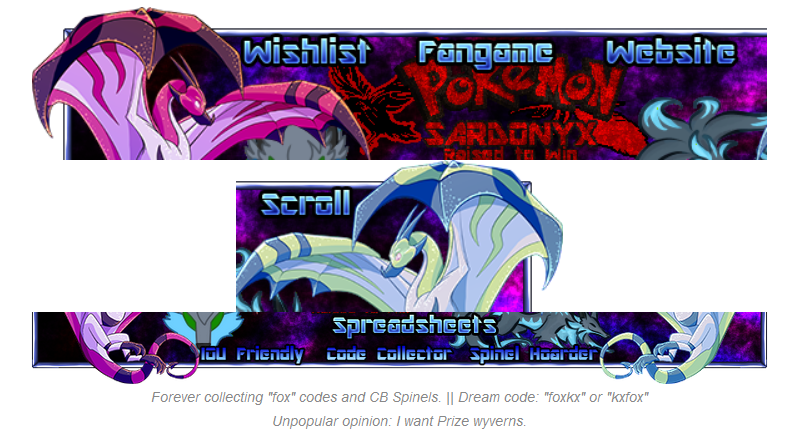 But for reference, the banner I have now is 850px across and displays fine on computer. Mobile probably looks a mess though, unfortunately. Tornadoes (tornados?) are scary! Stay safe! Our wind has stayed heavy all day. I have enjoyed my day off. Back to work tomorrow. A bright sunny Good Friday here with a lovely breeze so it's not too hot. Pretty AP is pretty with falconiform eggies! This one's PB - https://dragcave.net/lineage/ZoYJE - and the code's kind of cool, too! Not your usual time at all! How's it going in Tomorrowland? I have one from purplehaze's nebula/mint lineage. It's a really pretty combo. Well-caught getting three flipped ones! Sounds like you need more pinks. I saw your wines groups after I asked. Feel free to ask if there's anything I can help with. I have a mint fetish but I also love the whites, the red dorsals, and several others. Hmm. Storytime at your local library? And make friends with someone who could carpool? The AP is a fabulous resource. Do you have a favourite breed? Oh gosh. No nearby playgroups you can join so the kids can play while you 'adult' for a while? I am not a compulsive poster, I am a clueless one.....as in, I had no idea how to talk to people or where to do it. Pretty sure I was driving my mentor nuts so I asked them to help me make more friends so I wasnt sending them every little thing that I got excited about and here I am!!! Ah, Herk! Hello and good bye. Sleep well!